In our morning analysis we were expecting a correction towards minimum 1243 and 1233-34 in extension.Gold move exactly according to our expectation with a low 1239 and bouncing back.I am sharing two different time frame charts to predict possible next move of gold.please have a look in a chart below. 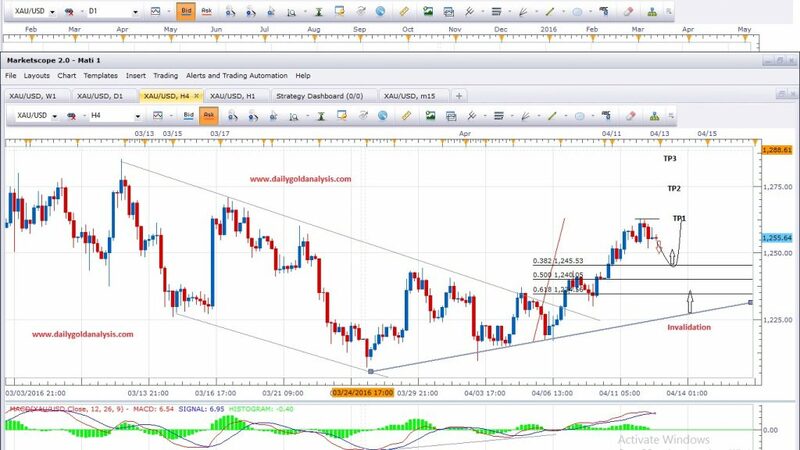 In our previous chart we set a Fibonacci retracement levels to get the support area for correction.Gold move downside and made a low around 1239.Gold could move higher now to the first resistance level that is around 1261-63.Movement above 1253 will confirm this target.Alternately MACD momentum is still indicating more bearish movement.If price fail to break 1253 then it may reverse towards 1233-34 that will be possible best buying area for gold.Overall we are bullish in gold , and we are looking for more better price to jump in the market.I have mention possible movement diagram in the chart below.Please have a look. For the reference of previous analysis i am also sharing previous 4 hour chart below. As per expecting gold break the rising channel from downside in the Asian session and find support around 1239.Now support of rising channel become resistance in 1 hour time frame chart.If gold follow the resistance , and reverse back then the possible next target for gold may around 1233-34.If gold break resistance and close in the channel again , we will jump in the market for bullish towards 1261-63.We will stay neutral and watch the market closely either it will break the resistance or reverse back.Please see the chart below i have mention possible resistance and support area with diagram.